Akebono Brake Industry concludes provisional contract to purchase land for new company in Europe｜News｜Akebono Brake Industry Co., Ltd.
Akebono Brake Industry Co., Ltd. (Akebono) established Akebono Engineering Center, Europe S.A.S., a subsidiary R&D center for foundation brakes (mechanism components such as brake calipers), in Europe in August 2013, and as part of the opening preparations, has entered into a provisional contract with Reims Metropole (metropolitan authority based in Reims, France) to purchase land on October 1st. 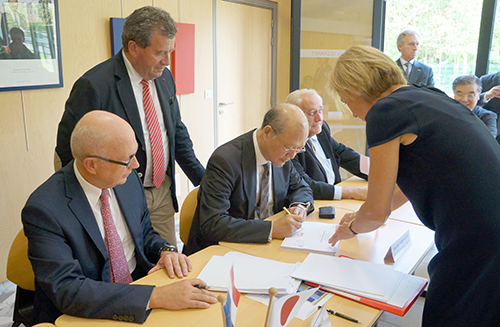 The signing ceremony was held in Bezannes town hall (near Reims) where the land is to be purchased, attended by Mr. Jean-Paul Bachy, president of the Regional Council of Champagne Ardennes, Mr. Jean-Pierre Belfie, Mayor of Bezannes, and Hisataka Nobumoto, President of Akebono. Currently, in France, Akebono has an R&D center for brake pads in Gonesse, and a brake pad manufacturing center in Arras. Additionally, in April 2014, a brake caliper manufacturing center was opened in Trenčín, Slovakia, and recently, a brake mechanism R&D center opened in Bezannes as part of the company's strategy to strengthen its foundation brake business in Europe. This initiative is aimed at augmenting global development capability by strengthening the company's presence in Europe and Asia, in addition to Japan- and U.S.-based development centers. This strategy is also a priority focus of "akebono New Frontier 30 - 2013", Akebono's current mid-term business plan. Akebono's strategy in Europe is to establish comprehensive operations from R&D through manufacturing and supply, thereby strengthening the company's global development network across four regions - namely Japan, USA, Europe and Asia. (1) Name: Akebono Engineering Center, Europe S.A.S. (1) Buyer: Akebono Engineering Center, Europe S.A.S. About Akebono Brake Industry, Co., Ltd.
Akebono Brake Industry Co., Ltd. (TSE:7238), founded in 1929, is a world leader in advanced brake and friction material development and production. The Akebono Group operates R&D centers in Japan, the United States, France, United Kingdom, China and ASEAN and decided to establish a new one in Reims, France and has wholly owned or affiliated manufacturing facilities worldwide. Akebono recorded net sales of 236 billion yen in the fiscal year ended March 31, 2014, and employs over 9,000 people worldwide on a consolidated basis. As a technology partner to the McLaren Mercedes Formula 1 team, Akebono has been supplying and jointly developing brake systems since 2007. For more information, visit www.akebono-brake.com/english/index.html.